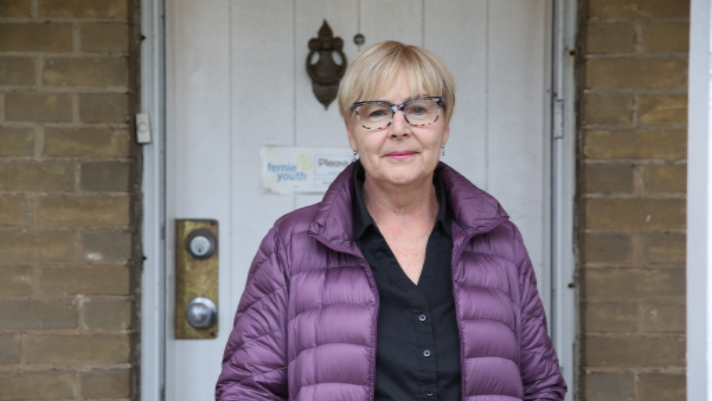 Today we talk with Faye Cummings, the Service Lead at Fernie Youth Services about her life’s journey as a youth justice advocate and her experience working at Fernie. Faye talks her passion for young people and goes deep into what “caring beyond reason” means to her. Check out Faye’s story below. I think that my friends would describe me as Resourceful, inquisitive/ curious, and logical. Well, that’s easy, the three things I am most passionate about are working with young people as evidenced by my lifelong career in youth justice, spending time with Family & Friends, and Traveling. Most of what motivates me is interaction with people; it is why I chose this as my career and why I have worked hard to be good at it.” I am most happy when facilitating the growth and success of others which plays directly into my passions. “I have wonderful people in my life, part of that is luck and part is cultivated. Pat and I were previously colleagues in our 20’s. Through that experience, we developed a mutual admiration for each other’s approach and commitment to the work. So much so that when we ran into each other years later, and Pat told me about his work here at Fernie, I gladly came out of retirement for the opportunity to work with him again and in a program that is able to provide an opportunity to young men who have so few resources available to them. I am thy Service Lead for community services, Responsible for the daily operations at YTS, Fernie Works and the Transition House. How do the youth value the work you do? I don’t really know if they do explicitly, I try to provide seamless support and advocacy as a facilitator of growth opportunities for the youths here at Fernie. The most important piece is for the youth to own their successes and attribute that success to the choices they have made. I feel that my value is inherent when the clients buy into their personal development program and successfully achieve their goals. Opportunities, Straight talk and Respect. What are you most proud of in regards to what Fernie does? Our guys are worth it, they are worth investing in. They have lots of hard work to do and years of disappointment to overcome. They need a safe place to make mistakes and fix them. A place where they can build confidence in their ability to do good things like: be kind to others, be self-sufficient, and explore their faith and values. The Young people who come into contact with youth justice, usually have some sort of disadvantage: Trauma and Poverty being the two most prevalent. The existing system of custody and detention makes every attempt to help youth improve their education, social skills within a strictly controlled environment. We at FYS (Fernie Youth Services) provide an extension to those services, though participation is voluntary. We can provide them a safe place to live, paid employment, educational opportunities and mentorship. This is not always a smooth road, but mistakes are a part of the growth process. Taking responsibility for one’s mistakes is an essential part of the development of personal ethics. The moments that stand out in my memory are of the funny and playful genuine interactions with clients. These generally occur when the young men begin to feel safe and comfortable. At Fernie, we have lunches to celebrate holidays or birthdays or graduations and to just have the opportunity to have fun together. The young men and the staff of Fernie Works cook together, eat together and then carry the conversation on after the meal or we play games. On those occasions, we get to see everyone’s sense of humor and share stories. The Meals, celebrations, and achievements like when a young man got an A in his Co-op credits or benchmarks in personal growth like when another broke a window and took responsibility for it. I studied Child & Youth Counselling, Art History, Business, and Demographics. Math was my favorite subject in high school, I always had a knack for it and always did well. Somewhere along my life path, I have developed the ability to accurately identify vehicles from its taillights. Which is odd since I have never really been into cars. I consider my level of happiness as the key metric of my success. If you had a chance to whisper in the ear of your teenage self, what would you tell her? If I could give my teenage self some advice it would be to stop being so judgemental. I guess that I’m happiest when I’m at my cottage in the Georgian Bay, I really like spending time with family and friends there. I like Rock and Roll, I grew up on it, but I like other genres as well. Oh yeah? Who are some of your favorite artists? My favorite artists growing up were The Beatles, Eric Clapton, and The Rolling Stones. Do you have any sports teams that you follow? Do you play any sports yourself? I don’t really follow any professional sports teams, but I really enjoy being outdoors. Whether biking, hiking or playing tennis on occasion. I volunteer for an accessible Non-Profit Theatre Troupe in my spare time. It’s very fulfilling. I really enjoy being able to look behind the scenes and witness the development process of each production. Watching how the director, the cast and production staff come together under one vision and create these amazing events.